Calligraphy is an art that is practiced everywhere in China. While in Beijing, go to any park and upon entering one will see men and women practicing; writing elaborate works just on the cement. For some, this art is just not a hobby; there are many calligraphy competitions on national Chinese television, many calligraphy works in museums and many professional calligraphists that make an exceptional living. Learn how to capture this art and make your Chinese characters come alive. Chinese painting is one of the oldest continual art forms in the world. Learn how to use a brush to paint the beauty of nature. This art form can be enjoyed at all levels from its simplicity when one starts to the realizations that it can never be mastered. In class you will view, study and paint pictures that capture your mind and heart. We offer classes in many Chinese instruments; two favorites are the Erhu and the Guzheng. The Erhu is a two string instrument that has been referred to as the “Chinese violin”. This instrument is a favorite among travelers because of its ease of transportation. This instrument is often scene being played on the streets and in the parks. Another favorite instrument is the Guzheng. This instrument produces a sound that fills the mind with the sound of nature. This board shape instrument consists of between 16 and 21 strings played in a way similar to a blues steel guitar. Even with just the basics one can create amazing works. If most Westerners were to be asked to name the three most famous Chinese people in the history of China they might just say, Bruce Lee, Jackie Chan and Jet li. Other than being movie stars, the one thing they have in common is that they all have practiced traditional Chinese martial arts. Martial Arts are part of the Chinese culture and through our programs you have complete access to many of the top teachers in all of China. These styles vary from peaceful internal to others which focus on combat. Pick a style that will relieve stress or one that you could learn to use a weapon like a sword or fight in a tournament. They are all available for you to learn. In many homes and on many doorways in China, one will find a beautiful knot decoration. There are several standard patterns, each with its own name and own meaning. Learn the dragonfly knot, six flower knot, temple knot, and many more. Learn this ancient art and then used it to decorate your and your friend’s homes. Chinese pottery is an art that has span more than 11,000 years. With China abundance of pottery making materials it is no wonder that this continues to be a product that is both demanded at home and aboard. Get your hands dirty and make a lifelong memory or start a hobby that can be practice at any age. With the size of China, many styles of folk dance have develop, but there is one thing they all have in common and that is they are fun for everyone. In the morning and nights one may often see people in the parks get together to practice this age old tradition. Let this class prepare you in order to get out there and dance with everyone. In Google, if one does a search for Chinese tapestry, the images that are found are amazing. The art of Chinese tapestry is one that has spanned generations with one generation teaching the next. Learn the knowledge of has been developed over lifetimes in our class. The art of tie-dye has been around for thousands of years. In the early days the dyes were extracted from roots, flowers, leaves, and berries. Although these dyes are still used today, synthetic dyes have been developed that are permanent, quick-setting, safe, easy to use, but the material has still remained the amazing silk that is available in China. Learn and study this art and then make your own gifts for yourself and your friends. 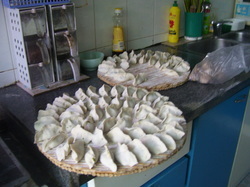 Have you ever wondered how to make jaozi, or baozi? How to mix the ingredients together and wrap then in a “tiny tortilla”? This class covers some of the simple Chinese dishes, which are fun to cook and great to eat. Learn about different dishes from the different provinces of China and how each province has their own special flavor when it comes to food. Since the invention of paper, Chinese paper cutting has been an art. In China, many doorways, and windows are decorated with this art to bring luck and good fortune to those who live inside and to keep evil spirits away. There are two methods, one is with using scissors and the other is with using a knife. Each of these methods is used to form a different style of paper cutting. In just your first lesson you will start to cut out patterns and make your own artwork.